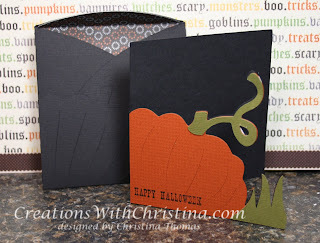 Here's a quick video on the pumpkin card from Cricut's Wild Card cartridge. I cut this card on the blackout feature because I wasn't too excited about the face on the pumpkin. What a cute card, you did a great job. thanks for taking the time to make a video. Can't wait till the ext one. I totally forgot about the Halloween thread. Great Job Christina ... cute card and simple too ... love your videos! I have this cartridge and have not used it much - your pumpkin card is cute - I didn't think about using the blackout to not have the details - great job! I love the way the card came out. I didn't like the face for the front card either and thought I would never use it.